Today in the ongoing saga of my freshman Latin notebook, we have a mystery! What doodle was so horrible, so offensive, or (most likely) so potentially embarrassing that I felt compelled to cut it out of the page? V.C. Andrews' Flowers in the Attic series. 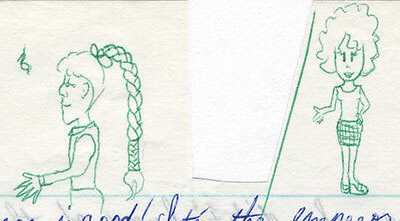 Apparently I spent the rest of this class period practicing drawing braids. Ja, vould you like some cocoa? 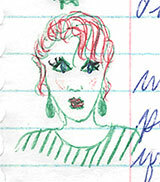 Then I had some fun doing a doodle makeover with my 4-colored ballpoint pen.